I don't know if I'd describe what Elvis plays on "Reconsider Baby" as lead guitar per se, and wiki is wrong in claiming he's playing a Gibson Super 400... it's clearly an acoustic. There is someone riffing on an electric towards the end of the song, but that's not Elvis. What Elvis plays is more rhythm while the sax and piano are the lead instruments. Elvis had a distinctive style of guitar playing... simple yet effective, and very easy to recognize. That's him on "Blue Christmas" and "One Night," and he's also the guitarist on "Are You Lonesome Tonight." Dave Hoos, Rickchick, Timmy84 and 6 others like this. Yeah. One of the unfortunate myths out there is that Elvis couldn't play at all and only used his guitar as a prop. He was no virtuoso, but he was a strong rhythm player and could play a little bit of sorta lead guitar. Once you start listening for it (those distinctive little bass runs he liked to do) you can hear his guitar playing is all over his records. Dave Hoos, artfromtex, RSteven and 4 others like this. Little Willie John recorded this track first in 1956 and it was released as a single and reached 24 on the charts. The song was received well by critics and considered one of the best of the time. Peggy Lee had a big hit with the song and it is regarded as her signature song, it was a top ten hit in the UK and Australia. Otis Blackwell co-wrote this song under the pseudonym John Davenport (his step-Father's name) due to a dispute with his publishing agent. The arrangement Elvis uses is in line with the Peggy Lee version. The sparse bass and percussion only seems to work well with this track. I think Elvis puts down a lot better and more convincing vocal than Lee, but everyone will have their own opinion on this. Little Willie John's version is a full band version with horns etc, and the vocal phrasing is very different. This is probably one of the most sultry songs recorded in the pre-eighties music world and really does deserve its place in music history. Great song, and this is a very restrained and effective version. Rickchick, Timmy84, RSteven and 2 others like this. Little Willie John's version. Great version, and very different. hugh . g. and Dave112 like this. Peggy Lee's version. Probably the most famous version, but for me her phrasing is often a little meeehhh . Just for the record while I am thinking about it. Who out of our Elvis experts knows the story/ies about the Elvis & Sinatra thing please? Only four years earlier Frankie was bagging Elvis like dog poop in a public playground and then Elvis is on his show and they're doing a duet. Was it purely a business thing? Did Frankie change his mind/apologise or some such thing? Was Elvis excited about the show, concerned about the show, completely oblivious about the show? Surely there is a story in there? 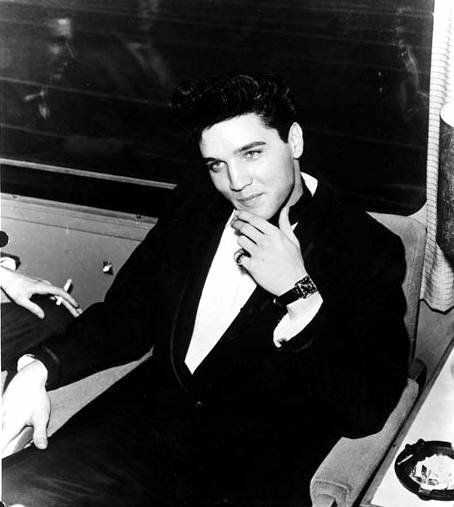 There was likely a business component to the 1960 television special -- Elvis was one of the biggest stars in the world and the ratings were going to be massive for his first television appearance and return to the spotlight after his Army stint. Sinatra was a savvy person and there was no way he was going to turn down showcasing Elvis. Whether Frank's prior comments from the 1950's were sincere is anybody's guess. Years later, Frank loaned Elvis his jet to fly Elvis and his new bride from Las Vegas to Palm Springs, so whatever issues there may have been at one point, did not seem to linger long term. Dave Hoos, Rickchick, Timmy84 and 2 others like this. well that's cool. I like that they were mates later at least. I don't really know much about Sinatra. I have read that after Frank met Elvis, he completely changed his opinion. I had read that Sinatra like many others of his generation originally considered Elvis to be a talentless flash in the pan. I have read that seeing him perform also debunked their original assessment of his talent. After Elvis' return from his army stint, a lot of the critics came around about Elvis. Sinatra also couldn't say too much since he was highly criticized for not serving in the military. Sinatra was officially listed as 4F due to a hole in his eardrum but there were a lot of rumors that he was given special treatment. I think that there are pictures of a very young Nancy Sinatra doing a photo opp with Elvis when he returned to promote her father's and Elvis' upcoming television show. Dave Hoos, Timmy84, PhantomStranger and 3 others like this. "The Girl of My Best Friend" is a song written by Sam Bobrick and Beverly Ross and first released in 1959 by Charlie Blackwell as the B-side to his single "Choppin' Mountains". It was made famous as a cover by Elvis Presley with The Jordanaires in 1960, the song peaked at No.9 in the U.K. singles chart (in 1976). It has also been covered by Ral Donnerin 1960 (No.19 U.S.), Johnny Burnette in 1962 and by Bryan Ferry for his 1993 covers album Taxi. A dance hall version was also released as a single in the 1990 by Tippa Irie and Peter Spence on GT's Records and Mango. Very strong with the backing vocals, this is a moderate paced melancholic love song. A common theme is music, which in some ways is a little disturbing, but the difference with this song is that the singer realises that if he ever acts upon this feeling, that he will lose the girl and the friend. This isn't the greatest song in the Elvis catalog, but it is pleasant and a steady, solid song. hugh . g., alexpop and Dave112 like this. Timmy84 and artfromtex like this. beccabear67 and Dave112 like this. "I Will Be Home Again" is a song written by Bennie Benjamin, Raymond Leveen, and Lou Singer, in 1944. The Golden Gate Quartet recorded the song on March 16, 1945. This version was released on Okeh Records #6741. Elvis Presley also recorded this song. 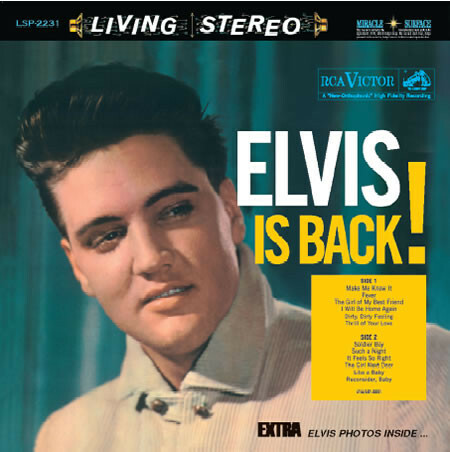 It was released on the album Elvis Is Back!. It was the first song that Elvis' army buddy, Charlie Hodge, sang harmony with Elvis. This is a really sweet song and I get the feeling that the song may have a reflection on, or from the army days. Elvis was obviously, from all reports, concerned as to whether he would still have a career and I am sure that was causing him some success. Just the fact that this album wasn't a huge seller probably gives justification to those concerns. It is also interesting that Charlie Hodge gets a harmony vocal that is reasonably prominent in the song, and was apparently an army buddy of Elvis'. There is somewhat of an Everly Brothers feel and sound to this track and it comes across really well. This is probably the first song I know of in the Elvis catalog that has such a prominent harmony vocal. Sure there were virtually always backing vocals on Elvis tracks, which seems to be purely a sign of the times that the songs were recorded in. It was only in the mid to late seventies when the backing vocalist started to get a hard time getting a job. I wonder, if they were buddies during the army years, did they duet this while they were in the service messing around on quiet nights? It comes across as very comfortable and being take four it isn't as though they were struggling through to get the right take. Although I kind of expected the sixties to become a little more quiet, I thought this album would create more discussion, so I was just doing one tune a day. I'm going to go back to two tracks, as that doesn't seem to be the case. It seems like April 4 1960 was a particularly good day for getting tunes in the can (Girl Of My Best Friend, I Will Be Home Again, Dirty Dirty Feeling, Thrill Of Your Love, Such A Night, Girl Next Door Went a Walking and Reconsider Baby all coming from that day. This is a great little rocker. There is a stop-start theme running through here and a nice variation on the typical rock and roll i, iv, v riff, with what sound like the bass, guitar and sax all playing it. There is a great little lead break from the guitar, I don't know if it's Scotty or Hank, but it's a corker. This is another one of those incredibly short track at just over a minute and a half, and yet feels fully satisfying. django5722, Tord and Dave112 like this. I've been so busy I just haven't had time to really respond to anything. As I've stated on other threads, the early 1960's is my favorite period for Elvis, and "Elvis Is Back!" is one of my favorite albums period. My favorite tracks off the album are "The Girl Of My Best Friend", "Girl Next Door Went A' Walkin'", "Like A Baby", "Such A Night" and "Reconsider Baby", but really they're all great. Shame it didn't initially sell as well as the soundtracks. artfromtex and mark winstanley like this. That's cool mate, I understand completely. Dave Hoos and MaestroDavros like this. With this (great) album, the sum is greater than the parts / it’s a bit tough commenting on the individual tracks as there just isn’t a lot to discuss about many (but not all) of them. S. P. Honeybunch, ClausH and mark winstanley like this. I don't have a lot to say about Elvis Is Back. It's a just a great album! I can listen to it straight through over and over. Elvis' voice is fantastic and the arrangements are spot on. I'm enjoying the trip so far. S. P. Honeybunch, RSteven and mark winstanley like this. On a side note. So many of Elvis' iconic album covers have been copied by other artists especially the first album. Morrissey strikes a similar pose and background to Elvis Is Back. 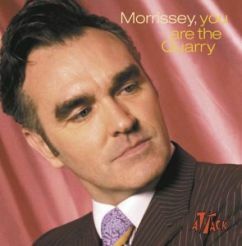 Some covers panned back showing a Tommy Gun some covers close up on Morrissey, you are the Quarry. GimmieSomeTruth, DirkM, S. P. Honeybunch and 2 others like this. Dave Hoos and Dave112 like this.